There are a couple of areas that the Oregon Ducks are certainly emphasizing under Coach Mario Cristobal. The first is a physical run game, a main component of offseason work. Yes, Oregon is still going to run all of the things that propelled them to the upper echelon of the college football world, but when push comes to shove, the staff wants to be able to depend on a physical, downhill rushing attack. Second, we recently discovered that Coach Cristobal wants to have two units of offensive linemen that he can either rotate in or platoon to keep them fresh through the entire of a game. That is at least 10 game-ready linemen. This idea also lends itself to a more physical run game. The fresher the line, the easier the yards will come as the game goes on. 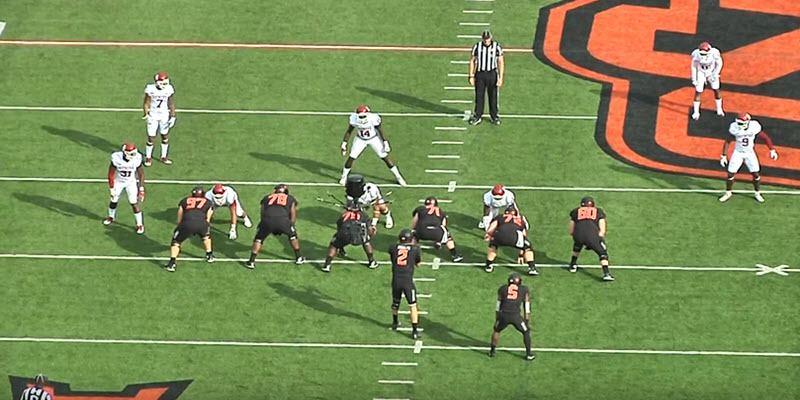 Oklahoma State Cowboys heavy package. In this article, I am offering another tool that could aide the Ducks in their attempt to become an unrelenting force up the middle. That tool is heavy packages, or a type of heavy package. What I mean by that is any formation that uses at least six offensive linemen. Like a few of the other topics we’ve touched on in the last couple of months, these packages are something that the Oklahoma State Cowboys use (see photo above). Thus, this is something that Coach Marcus Arroyo would have picked up during his time in Stillwater. In this package, the offense replaces a tight end with an extra offensive lineman. In doing so, a much heavier body, and a more sound run-blocker, gets on the field for the offense. This often equates to roughly a 70-80 pound difference that either a defensive end or linebacker now has to take on. Additionally, depending on the play call, an extra lineman allows one of the other five linemen an easier path getting to the second level of the defense. A few NFL teams have also been implementing six linemen sets in their offense. Their reasoning is that they are getting a lot of tight ends from the college level that are basically just large wide receivers who don’t possess the blocking ability that NFL tight ends used to have. The extra lineman allows them to get a more polished blocker on the field to help control the line of scrimmage. Of course, Oregon wouldn’t be the first Pac-12 team to use extra linemen: the Stanford Cardinal do this quite often. The difference is that Stanford does it from tight sets and the Ducks would obviously be doing it from a spread. 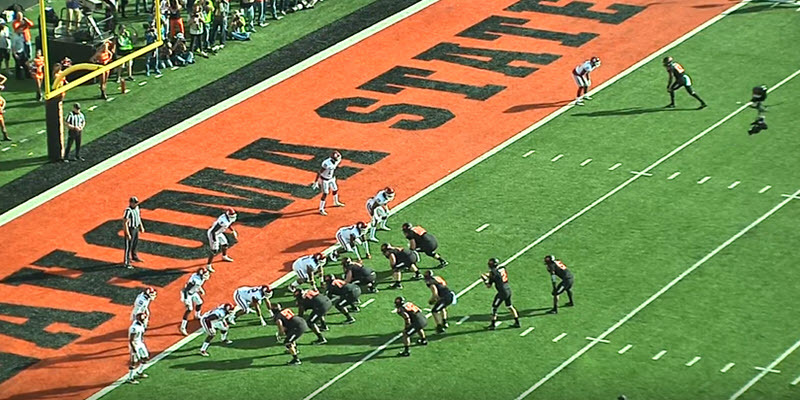 Imagine the formation pictured above being used in Autzen Stadium. 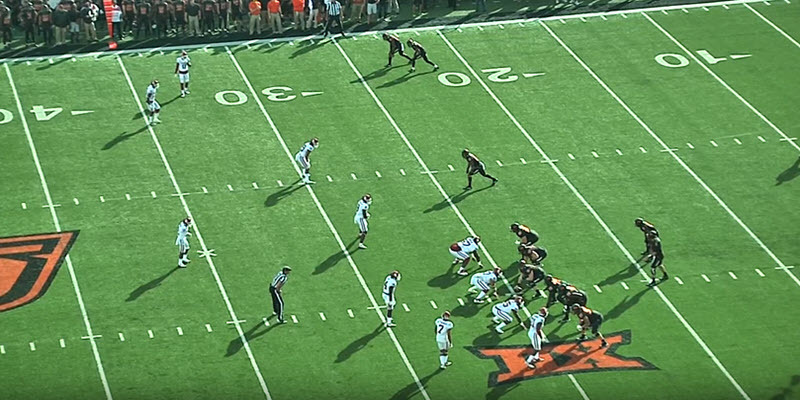 The splits of the receivers will put the defense in that familiar, uncomfortable spot where they have to decide whether they’re defending the box or the perimeter. Except now Oregon will have an extra advantage in the box. There also exists the possibility of creating a variety of goal-line sets with these heavy packages (see above). This may be a subject that demands an article all to itself, as I was completely unaware that I was going to find so much within the Cowboys offense that I’d like to see at Oregon. Nevertheless, here we are. 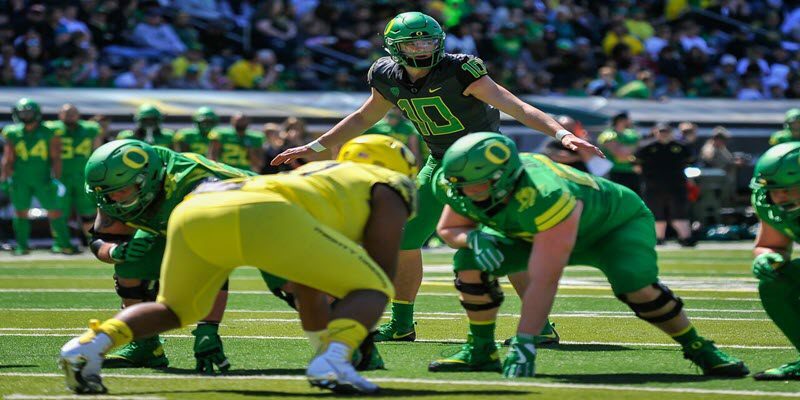 Heavy packages would not only aide the Ducks in their quest for a dominant downhill run game, but would also make extra use of the 10 offensive linemen Coach Cristobal hopes to have ready this fall. It is something that I certainly hope to see this coming season.